Competition for the AGDF 12 CDI 5* continued on Friday at the Adequan® Global Dressage Festival (AGDF) with four major classes. Starting out the day, American Chris Hickey topped the FEI Prix St. Georges, with Ronaldo. Fellow American Adrienne Lyle finished first with Wizard in the FEI Grand Prix Special CDI 5*. Canada’s Megan Lane and Caravella clinched the first place prize in the FEI Grand Prix Freestyle CDI 3* and Tina Konyot (US) and Calecto V took top prize in the FEI Grand Prix Freestyle CDI 5*. The FEI Grand Prix Freestyle CDI 5* was the finale event of the “Friday Night Stars” series at the 2014 AGDF, and ended it in great fashion with a packed house of spectators. Konyot received a crystal horse from the Esperanza Collection of Swarovski for her winning ride with Calecto V, her 16-year-old Danish Warmblood stallion out of Bahera by Come Back II. The pair earned an impressive 79.250% to pick up the top prize for the class, while second place finisher Mikala Gundersen scored a 76.775% with My Lady. Third place went to fellow Dane Lars Petersen and Mariett. The pair scored a 76.625% for their performance. Petersen was also awarded the Mary Ann McPhail Award for maintaining the highest international ranking of any rider throughout the twelve weeks of the AGDF. Canada’s Belinda Trussell placed fifth aboard Anton (74.950%), and David Marcus was eighth riding Chrevi’s Capital (72.900%). Young professionals ruled in the FEI Grand Prix Freestyle 3*, with Canada’s Megan Lane (22) winning the class with Caravella. The pair score a 71.600% for the blue ribbon, while 26-year-old Laura Graves (US) and Verdades took second with a 70.250%. Third place went to Gary Vander Ploeg (CAN) and Degas for their score of 68.350%. David Marcus (CAN) was fourth riding Don Kontes to a score of 67.625%. Lane listed several elements of her choreography as points that raise her degree of difficulty, including piaffe and double pirouettes, one and two tempis on a circle, and an extended trot on a loop. “There was a little mistake in the one tempis, but because of the degree of difficulty in that, something always happens! Our piaffe-passage was definitely a highlight this time, too. I’m really happy with that,” Lane explained. Lane has her eyes on making the team for Canada in the Alltech FEI World Equestrian Games (WEG) later this fall, and appreciated all of the experience she has gained over the last three months at the AGDF. “The experience is priceless. The more experience we get, the more comfortable both of us are. I’m so lucky to be able to come down here and have the chance to ride multiple grand prix,” Lane said. Adrienne Lyle (US) and Wizard capped off an incredible AGDF season with another victory lap after winning the FEI Grand Prix Special CDI 5*. The pair earned a top score of 75.588% to earn the class by a substantial margin. Second place went to fellow American Michael Barisone, who rode Ellegria to a 69.392%. Cesar Parra completed an All-American top three with Van the Man. The pair earned a score of 69.078% for third place. Canada’s Tom Dvorak was fifth riding Viva’s Salieri W to a score of 66.294%. Chris Hickey (US) and Ronaldo finished first in the FEI Prix St. Georges on a score of 71.842%,followed by second place finishers Denielle Gallageher-Legrif (CAN) and Argo Conti Tyme with a score of 69.781%. Third place went to Shannon Dueck (CAN), who scored 69.561% aboard Cantaris. Fellow Canadians Christilot Boylen and Chris Von Martels also competed in the class. Boylen was fourth aboard Drentano (68.947%) and seventh with Florencia 22 (68.026%), while Von Martels took sixth riding Zilverstar (68.509%). On Saturday, American Olivia LaGoy-Weltz picked up her third first place prize in the FEI Intermediaire-1 aboard Rassing’s Lonoir, her 10-year-old Danish Warmblood gelding (Lorani x De Noir), to the top of the class with a 73.421%. 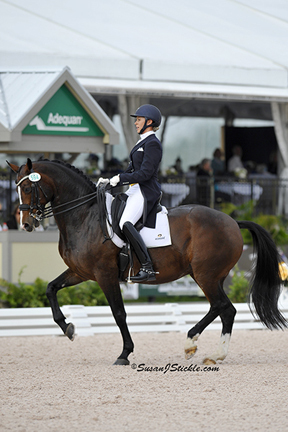 Second place went to Canadian Chris Von Martels and Zilverstar, who scored a 70.833%. Christopher Hickey, also of the United States, took home the third place prize for a score of 70.789% with Ronaldo. Canada’s Christilot Boylen was fourth with Drentano (69.605%) and eighth riding Florencia 22 (67.851%), while Denielle Gallager-Legrif was sixth aboard Argo Conti Tyme (68.640%). For full results and more information, visit www.globaldressagefestival.com. 8 David Marcus, CAN, Chrevi’s Capital, 14-year-old Danish Warmblood gelding owned by Deborah Kinzinger-Miculinic, Indira Gandhi x Obelisk: 74.375%, 74.250%, 70.625%, 73.500%, 71.750%, 72.900%.